I love crunchy things. 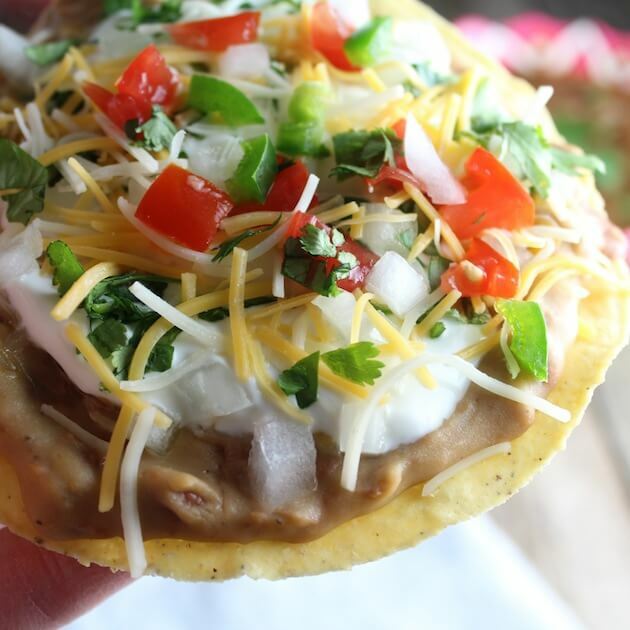 Nuts, potato chips, fresh veggies and especially Mexican Pizzas! When I was away at college a few years (or decades) ago, a girlfriend introduced me to Mexican Pizzas from none other than…Yo quiero Taco Bell! I remember that cheesy, beany crunchy disc of goodness well. My only complaint was that there was only one in the box. 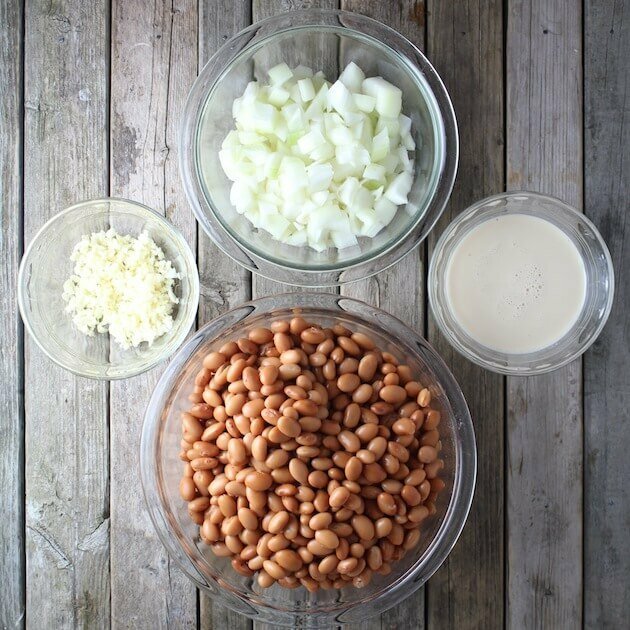 You drain and rinse 4 cans of pinto beans. Add some olive oil to a saucepot on medium-high heat on the stove. Sauté some chopped onions for 6 minutes, stir in some minced garlic and cook for another minute. Add in your beans, 2 cups of chicken stock and salt and pepper. Put the lid on and let it come up to a boil, then turn it down to medium-low for about 30 minutes. Take off the lid and bring it back up to medium or medium-high and let it cook off some of the liquid for about 10 minutes. Stirring regularly so they don’t burn on the bottom. Then you turn off the heat and get your mash on!! Add a bit of the evaporated milk, keep mashing, maybe add more milk until they are creamy. 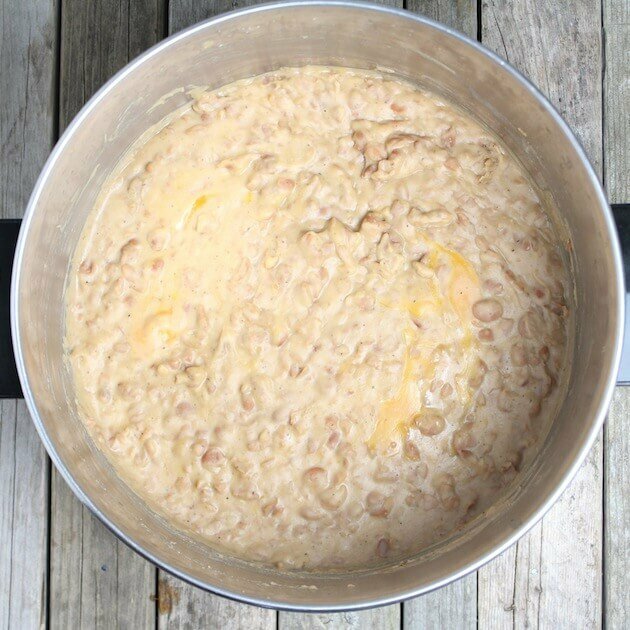 Toss in chunks of cheddar cheese, wait a few minutes while the beans and cheese become buddies and then stir gently. 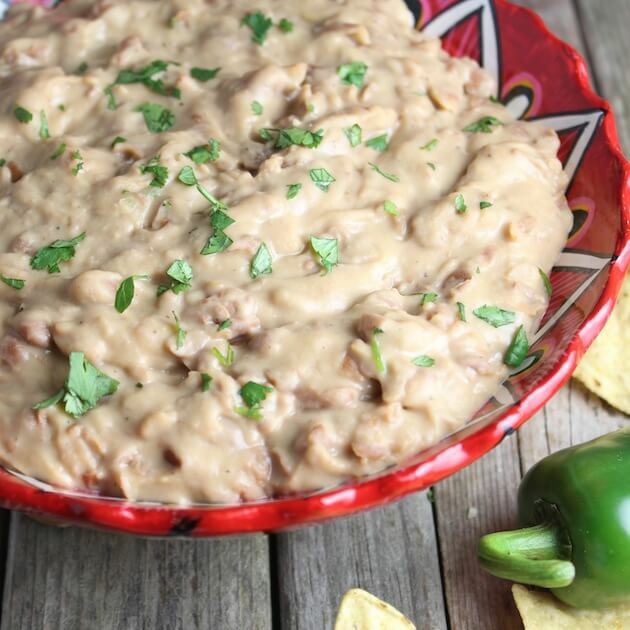 Behold, ooey-gooey melty cheesy creamy homemade non-fried refried beans! 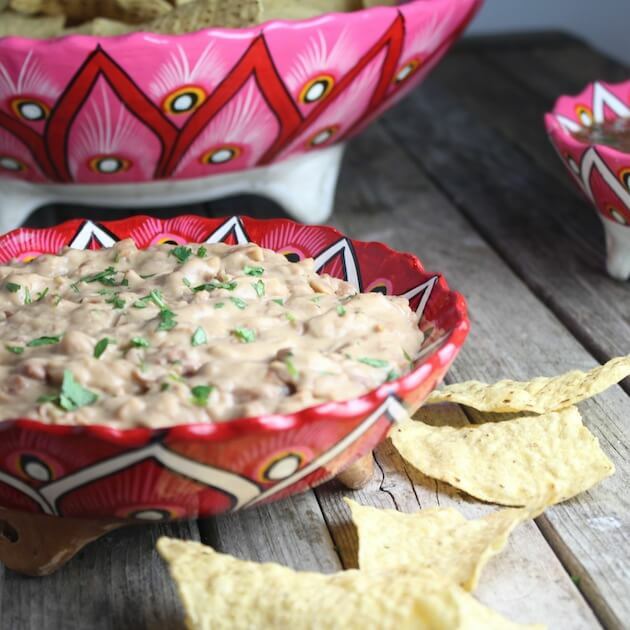 Thank you Christina for giving me this wonderful gift – the Homemade “Refried” Bean recipe!! Christina went on to tell me how she put her beans on crunchy flat corn tortillas (corn tostadas) and made Mexican pizzas!! 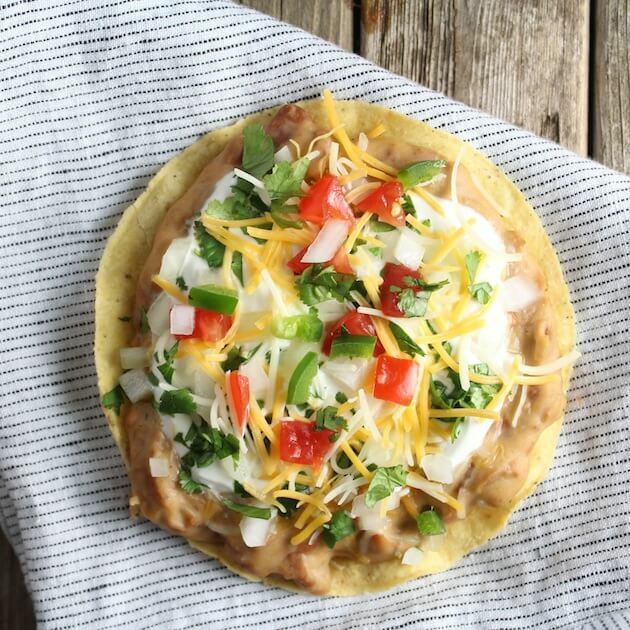 Wait a minute – hold the phone…I can make my own Mexican Pizzas! Move over Taco Bell cause Holly Belle’s stepping up her Mexican game! 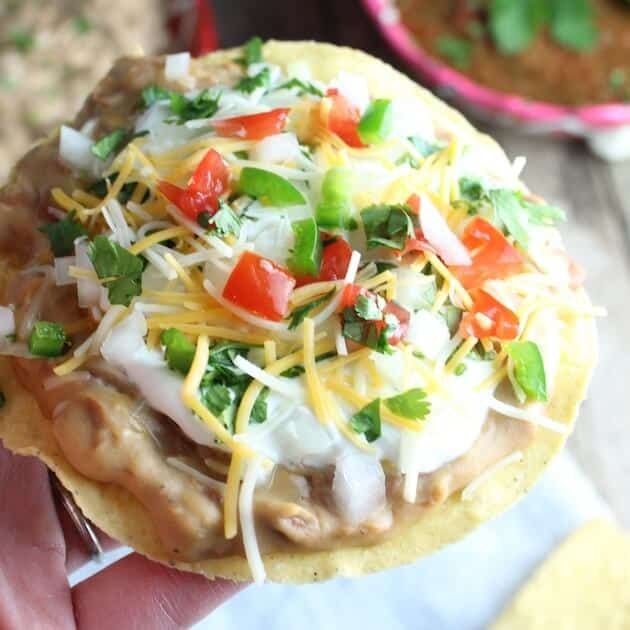 Up until this point in my life I had no idea I could buy these crunchy discs AKA conduits/channels/carriers of melty cheesy creamy homemade beany goodness.✨ AND make my own MEXICAN PIZZAS??? Mind blowing – eye opening – life altering information! 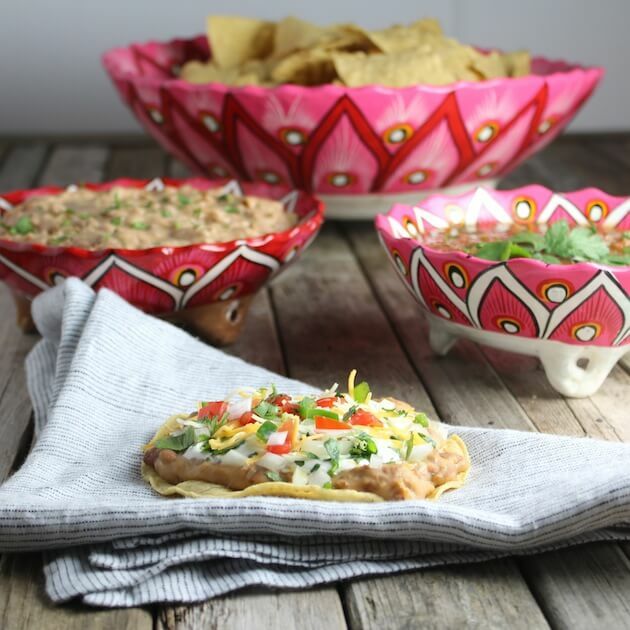 Without any further ado, I give you…Mexican Pizzas – Holly Belle style! I like to put my tostadas in the toaster oven for 1½ minutes. Then slather on some Homemade Refried Beans, and whatever else makes me happy: cheese, sour cream, green onions, tomatoes, salsa, jalapenos, avocados, pulled pork, Beef Barbacoa, grilled chicken…I’ve even topped them off with an egg and made huevos rancheros! How fun would it be to have a Mexican Pizza Night… maybe with a little Queso Fundido on the side… put out all the fixin’s and let your guest go at it. Plus, all the kiddos will absolutely LOVE them! 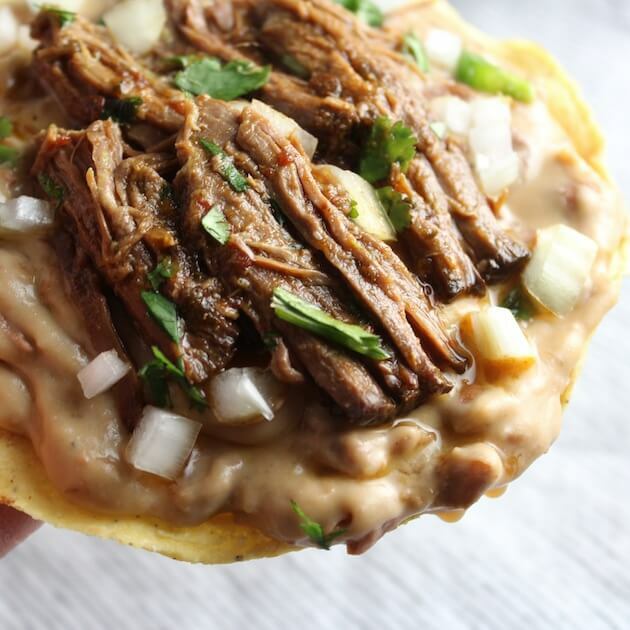 I think Taco Tuesday just became Tostada Tuesday if you know what I mean. Yo quiero pizzas Mexicanos!! Drain and rinse 4 cans of pinto beans. 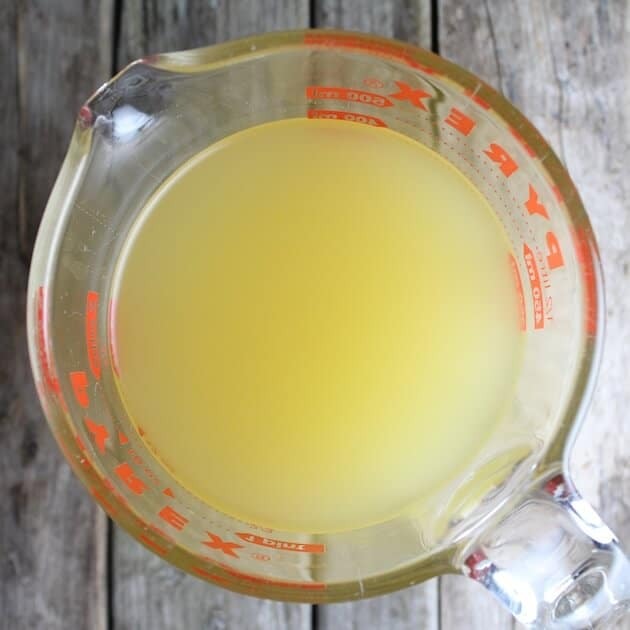 Add some olive oil to a large sauce pot on medium-high heat, and sauté chopped onion for 6 minutes. Sprinkle with salt and pepper. Stir in minced garlic and cook for another minute. Add in your beans, 2 cups of chicken stock and 1/2 teaspoon both salt and pepper. Put the lid on and let it come up to a boil, then turn it down to medium-low for about 30 minutes. Take off the lid and bring it back up to medium or medium-high to cook off some of the liquid, for about 10 minutes. Stir regularly so the beans don’t burn on the bottom. Turn off the heat, and let the beans cool about 5 minutes. Then mash the beans with a potato masher. Add half of the evaporated milk and continue mashing until the beans are creamy. Toss in the cheddar cheese, do not stir and let the beans rest for 5 minutes. Add in the rest of the evaporated milk and stir gently. 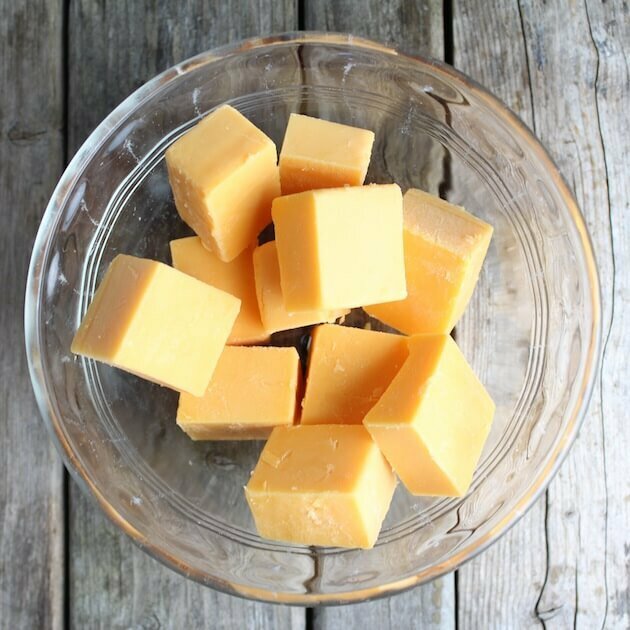 Ideally leave some of the melted cheese in very small chunks or ribbons. Serve warm. Heat tostadas in a toaster oven for one and a half minutes, or on a cookie sheet in a 350 degree oven for one and a half minutes. 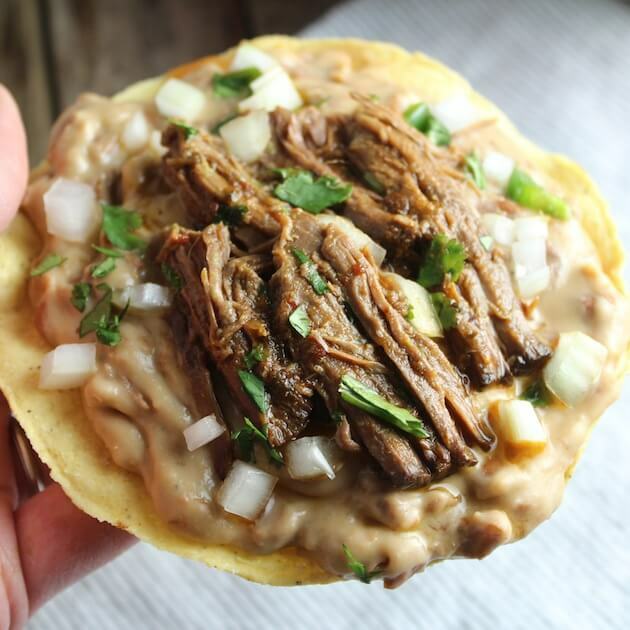 To assemble, start with a layer of refried beans. Next layer on meat of your choice, cheese, sour cream, onions, jalapenos, and cilantro. For a lacto-ovo vegetarian pizza, omit the meat. 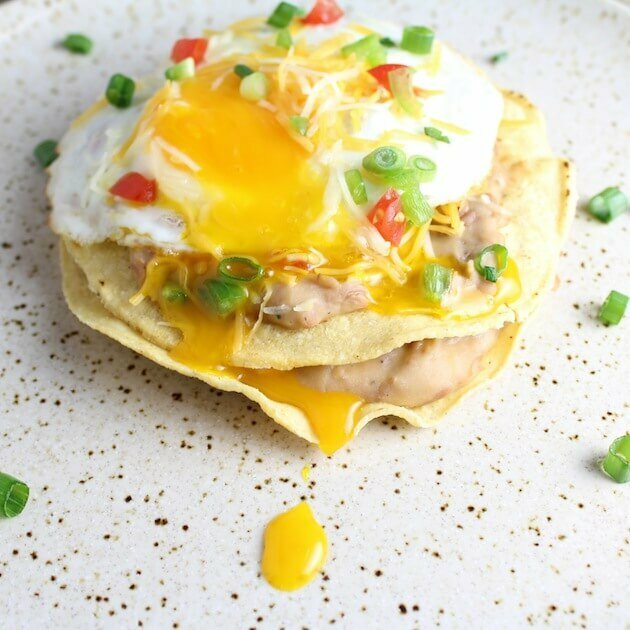 For huevos rancheros, replace the meat with fried or scrambled egg.